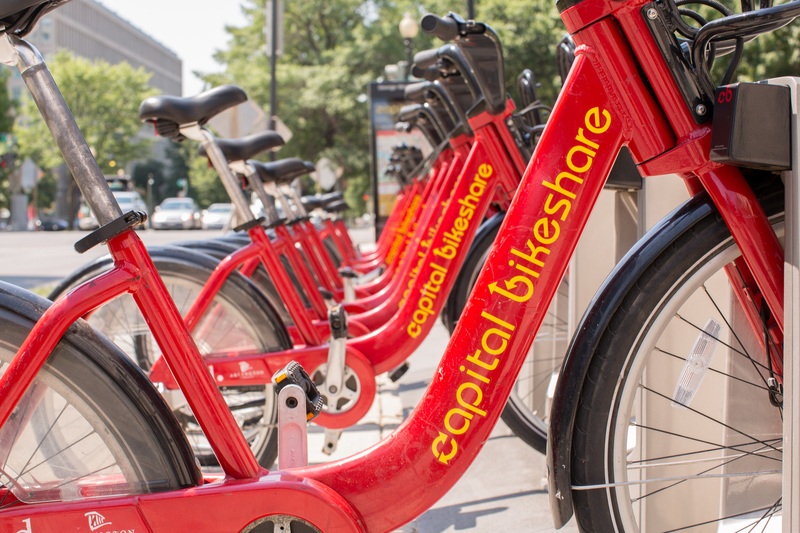 Tips for navigating D.C. by bike, bus and Metro. Campus Life 101 is a new series from GW Today that offers tips on the basics of navigating life at college from staying safe to adjusting to college academics and managing stress. 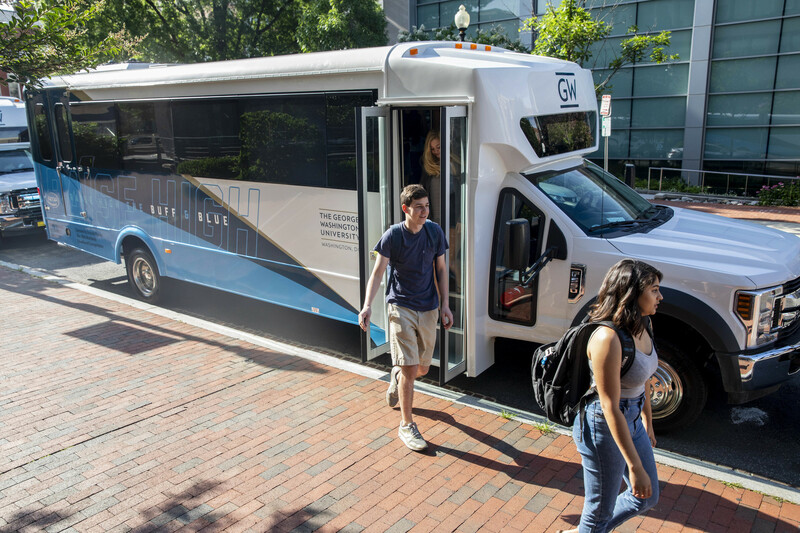 The Vern Express runs between Foggy Bottom and the Mount Vernon campuses. In Foggy Bottom, it stops at the main entrance to Funger Hall (2201 G St., NW) and, from 7 a.m. to 8 p.m., the Red Cross Building (2025 E St.). The VSTC Express runs between the Foggy Bottom and Virginia Science and Technology campuses. The Wiehle Express stops at several points in Loudoun County, the Wiehle-Reston East Metrorail station and the Virginia Science and Technology Campus. A TransLoc Rider App for Android and Apple phones is available for riders of the Vern Express and VSTC shuttles. The app provides the next two departure times for each shuttle stop, a “Notify Me” function with which riders can set push notifications when a shuttle is arriving at a GW shuttle stop and a map to see where shuttles are en route. A web portal is also available. The Washington Metropolitan Transit Authority (WMATA) operates Metro, Metrobus and the DC Circulator, all accessible via SmarTrip card. 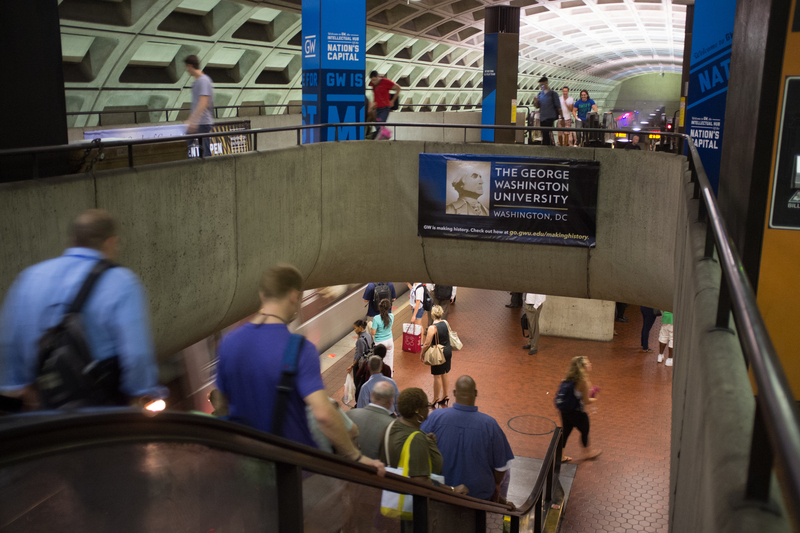 SmarTrip cards are available to members of the university community at the GW Campus Store (Marvin Center, lower level), where they cost $7 and are pre-loaded with $5 in value. SmarTrip cards also can be purchased at Metro stations and online from WMATA. 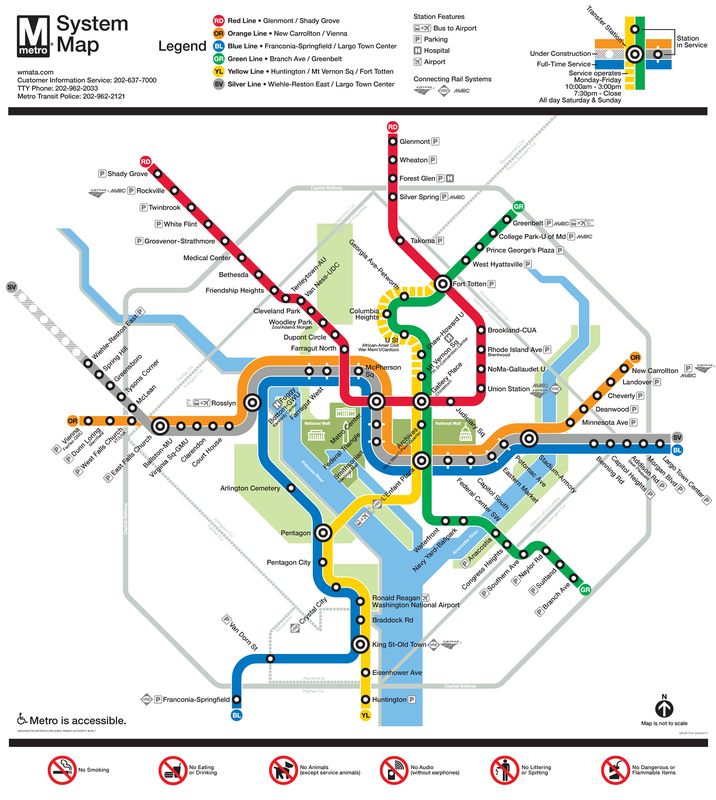 The D.C. Metro system is fairly easy to navigate, with six intersecting route lines—Blue, Green, Orange, Red, Silver and Yellow—branching through D.C., Maryland and Virginia. Trains run from 5 a.m. to 11:30 p.m. Mondays through Thursdays, from 5 a.m. to 1 a.m. Fridays, from 7 a.m. to 1 a.m. Saturdays and from 8 a.m. to 11 p.m. Sundays. The Foggy Bottom-GWU Metrorail Station, the closest stop to the Foggy Bottom campus, is on the Blue, Silver and Orange Lines. Also within walkable distance is Farragut North on the Red Line. Use WMATA’s Trip Planner tool to figure out your best route. Eating and drinking are not allowed in Metro vehicles or stations. When waiting for a train, stand at least two feet behind the edge of the platform. Flashing lights along the platform edge announce that a train is arriving. A recorded voice followed by chimes warns that train doors are closing. These aren’t like elevator doors—they have no sensor and won’t automatically open if you put an arm in them. Don’t get caught! On Metro escalators, stand on the right side and walk on the left. The DC Circulator’s Georgetown to Union Station route offers convenient downtown service, with stops along K Street and Pennsylvania Avenue. Other routes go from Dupont Circle to Rosslyn, from Eastern Market to L’Enfant Plaza, from Woodley Park to Adams Morgan and around the National Mall. All Circulator rides cost just $1 in cash or on SmarTrip. Metrobus names and routes can be confusing at first. As with the Metrorail, use WMATA’s Trip Planner tool to determine the easiest way to take a bus to your destination. D.C.’s growing network of bike lanes has made biking an increasingly popular and environmentally friendly option. (When biking, be sure to use a helmet and keep bike laws, traffic and safety in mind!) Bike facilities at GW’s Foggy Bottom campus currently include nearly 700 bike parking spaces, consisting of street-level parking spaces and spaces within academic and residential buildings. Amenities for bike commuters include the provision of bike racks in university garages, a reduced rate for shower-only Health and Wellness memberships for faculty and staff and bicycle registration services with the GW Police Department. Bike racks also are available in certain residence halls. Capital Bikeshare's Mount Vernon Campus rental station is at 48th Place and MacArthur Boulevard. Bike rentals also are available on the Mount Vernon Campus from the Department of Athletics and Recreation at the West Hall fitness center on the lower level.